Interval run today. I really didn't want to do it, and I realized that I've been dreading my runs a lot again lately. After the marathon, I loved the short, fast running. I decided that I'm going to rework my running plan, so that I won't dread it (as much) anymore. I've liked running five days a week, so I'm going to continue to do that. And I have to include a long run up to 12 miles once a week. For the other four runs, I'm going to keep them short instead of increasing distance like my schedule calls for. The shorter runs will be 3-4 miles; two at an easy pace, one at a tempo pace, and then one for intervals. The interval run will include eight 1/4 mile repeats. That's how the schedule was shortly after the marathon, and I really liked it. So today was an interval run, and I decided to do eight repeats instead of nine. I also decided to do them on the treadmill; not sure why. I set the treadmill for 9.0 mph (that's a 6:40/mi pace--yikes!) and then hopped on. I ran like hell for 1/4 mile, and then hopped off and took a breather while the treadmill kept going for 1/4 mile. And I repeated that for a total of eight time. That speed was HARD. It took me roughly a minute and 40 seconds to do each interval at 9.0 mph. That's a long time to run that fast! I used to do my 30 second sprints at that speed, and it was tough then. After doing eight intervals, I'd only run for a little over 13 minutes total, but I was completely spent and dripping with sweat. After I was done, I took Noah to the doctor--he's had a stubborn cough. He gets asthmatic bronchitis every year at this time, so I was sure that's what it was. I have have to give him breathing treatments three times a day until it clears up. When I got home, I started working on a cover for my Weight Watchers 3-month journal. I had just made the denim one when WW went and changed the size of their journals, so I wanted to make a cover for the new one. I used a giraffe print fabric, and I love how it turned out! Tomorrow is my Wednesday Weigh-in, but I don't think I've lost this week. Last week, at 134, I was just a single pound from goal--but these last few pounds have been killer to get off. I still haven't binged (93 days now! ), and I've counted my WW PointsPlus religiously, but I've seen 134-135 all week on the scale. 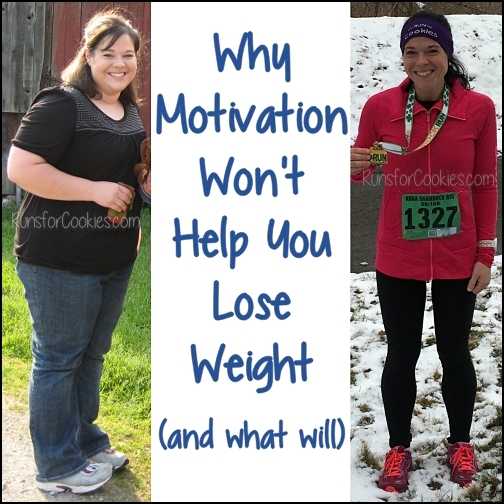 Speaking of that, my sister called me yesterday to ask about weight loss and running. 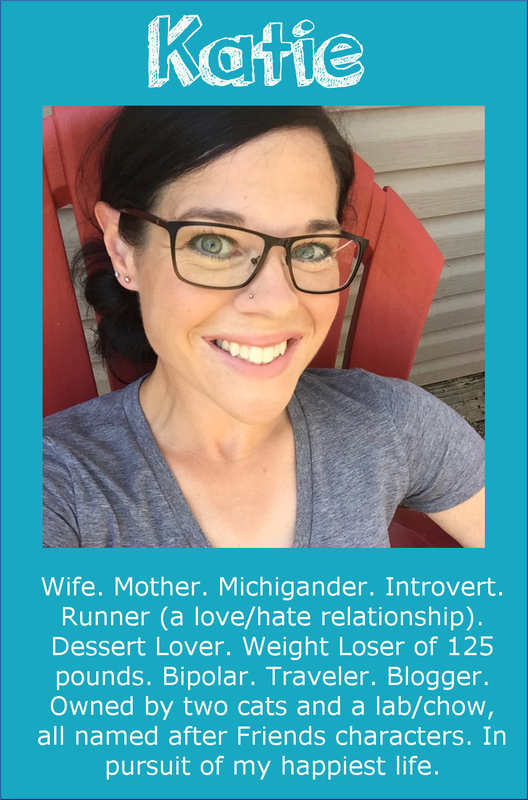 She signed up for the virtual 5K next month, and she said her goal is to run the whole thing. She sent me a text about a week ago saying that she ran a whole mile without stopping, which I was super excited about. She ended up running about four miles total last week. She's also been completely religious about counting WW PointsPlus, and she was expecting to see a big loss on the scale--but she "only" lost 0.4. That's completely discouraging for her, which I totally understand. My mom had the same thing happen when she started training for the 5K as well. 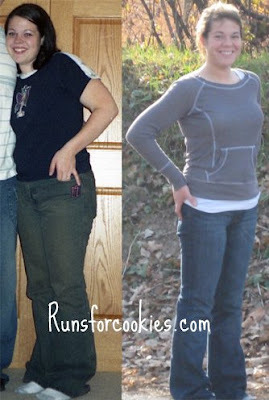 As soon as she started the C25K program, her weight loss stalled, even though her diet was great. I get e-mails all the time asking the same thing, and I just want to say that it's normal! It happened to me when I first started running, as well as after I've taken a week or more off of running (after my surgeries and after my marathons). I wrote a post about it a while ago, which you can find here. But basically, your muscles hold on to water when you start pushing them by exercising. The scale may stall, but if your diet is good, you're probably still losing fat. It might take a couple of weeks to start moving again, which can be frustrating. In the past, that always used to make me give up on my efforts. In 2010, when I started training to walk the Indy half-marathon, the only reason I didn't quit exercising was because I had committed to that race. I knew if I stopped exercising, my body would drop those few extra pounds of water that my muscles were holding onto, but I wanted to do that race--so I stuck it out. And after a few weeks, the scale picked up again. I weighed the same in both of these pictures--152 pounds. In the picture on the left, I was wearing barely squeezing into size 12 jeans. 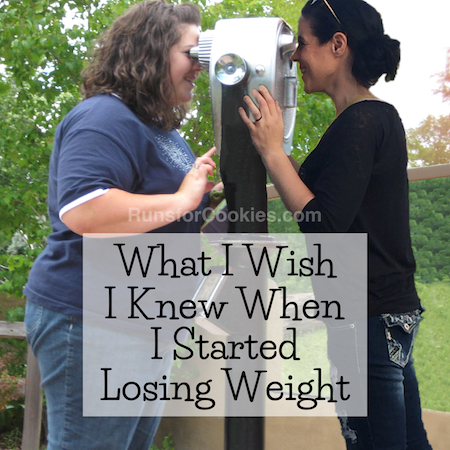 I had just lost about 50 pounds before my wedding by doing Weight Watchers; I didn't exercise at all, I just counted WW Points. In the picture on the right, I was wearing size 4 jeans. I had just lost 101 pounds from diet AND running. The only variable is the running. Think of this when the scale isn't moving, but you're doing everything right--you WILL see progress if you keep moving forward! That visual of you at same weight, but different sizes seriously puts it into perspective--a size 12 compared to a size 4?! Insane and AWESOME. Visuals definitely make the difference for someone struggling during something like this. Your post is very timely for me. I had my weigh in today and I stayed the same and I know it is due to increased exercise and having a cold. I plan on staying the course and yout post is extra motivation for me. Love the cover, so cute! I really needed to read this today. I've been losing weight for 2 years. And I've lost 50lbs. I recently started training for a triathlon and was super disappointed with my weigh in this week. Logically, I know it's not a problem, but reading this really hit home for me! Like the girls who've posted before me, I NEEDED this today! Seeing your comparison pic is so incredibly motivating!! I've been stalled for awhile now and although it's not because I've started running, I have started to increase my daily activity and walking. I've been feeling like my clothes aren't so tight and I can see a difference in my fact but the scale is being a b**ch!! lol Thanks for all your motivation and support, you have no idea how much it's appreciated! Oh yeah, I loved your first cover for your 3mo journal but this one is GREAT!!! So cool! Great picture. Thanks for this post...I really need to remind myself about this. Im NOT a runner but I do workout thrice/five times a week. I'm at a constant war with my scales. I sooo needed to read this post today!! I have been working on the C25K program for 5 weeks now, exercising more than the 3 days per week, watching my diet, and the scale is hardly moving. I am glad I'm not the only one!! I guess just keep it up?? I cannot even imagine running 9mph...I just got up to 4mph today!! love your blog, you have inspired me so much!! Thank you so much for this post! I have been counting points and exercising and the scale won't budge. I am 7lbs heavier than my lowest weight (i have gained a few and can't seem to lose them no matter what i do) but others keep asking me if i lost more weight. I don't see it but i guess the scale is not the only way to judge progress. I am committed to my marathon which is only a month away. I figure after maybe i will be able to get the weight loss going again and get rid of these last 25...+7 lbs i still need to lose! Also, strong work on the speed! I went for a run today and sprinted back to the car...only a tenth of a mile but it was a 6 min mile...who knew i could move that fast! Can't wait to be done with marathon training to work on shorter, faster runs! Thank you for posting this! 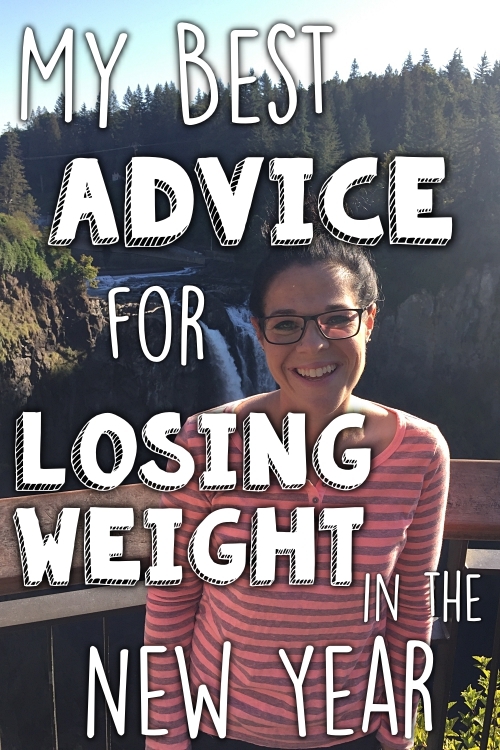 This is quite timely since I just weighed in with a 0.2 loss this week and I was starting to feel discouraged. I love your blog!! You have done an amazing job at transforming your life. I have a question, what brought you back to Weight Watchers? I think from what I have read you started with WW but then went to calorie counting? I ask because I go back and forth between the two. 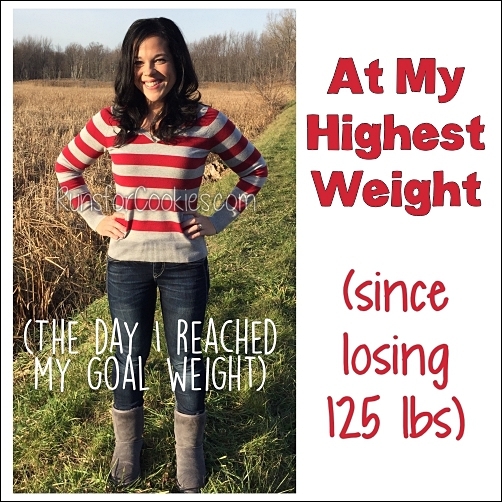 I am a Lifetime member and am a few lbs over goal. I am trying to figure out if I want to go back to WW or count calories . I have been doing a bit of both and it is exhausting. Thanks so much, you are awesome!! Thank you, thank you, thank you! This post couldn't have been more timely. I'm 90 pounds into a 101 pound weight loss and the scale has been stuck for the last two weeks! AND it only crept down over the previous two weeks even though I worked my *ss off on/around Thanksgiving and maintained my usual calorie/carb intake. Grrr! It is so frustrating to see the light up ahead and feel like it's keeping pace with you as you run towards it. It helps to know that other go, and have gone, through the same thing. Thanks again! Wow - that picture of you really is the best thing you could ever post as a testament. Thank you for reposting it (I think I've missed it before) and I can't tell you how poignant it is in terms of why the scale isn't always the best measure of your progress. Love your journal cover! Sometimes I forget that you sew too, and that you aren't just a dieting running cookie eating gal! 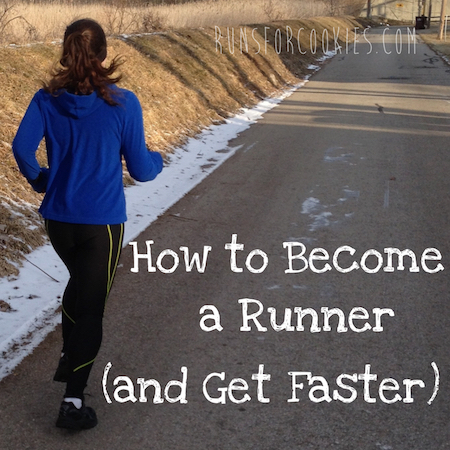 Hope you can find that magic formula so you don't dread your runs quite so much. Love how you continue to tweak everything (diet, exercise) even now. It's really a lifelong journe isn't it? Also love the comparison picture. You look fantastic at 152 lbs. especially in the second picture. I wish I looked half that good at 150.2 lbs. which is what I weighed this morning. But then I've got 30+ years on you so that ain't happening! I agree completely with previous posters. This post is EXACTLY what I needed. I ran my first half back in September and didn't lose any weight until after I finished the half. I'm registered to do another half in Feb. and am determined to track every single thing I eat (been doing WW off and on for YEARS)and actually get this last 25-30 lbs off. For 3 weeks I've been gaining/losing the same 2 lbs but you are completely spot on. Patience and persistence. I will NOT get discouraged and give up. Thank you soooo much for sharing your journey with us! i did a half-marathon on sunday and i'm up like five pounds, even though i've been eating fine. but my muscles are still very sore so i'm hoping that's why i'm still up so much. so annoying! I needed this post right now so much! I'm really struggling to keep my diet intact since I haven't seen the scale budge in awhile. OMG, I totally needed this post! I am having the SAME problem. It's frustrating when you look at the number and even you though feel thinner it doesn't "show"...but I have to remember that it does really show because I was able to fit in a smaller pair of jeans this weekend and I could run 1.5 miles straight today! Patience is a hard thing, especially when you are doing all the right things. Good luck to your mom and sister! Thanks for the encouragement! Were you really the same weight????!!!?? I remember when I weighed 152 and was the size 10/12. The difference there between the two sizes is crazy!! A size 12 and a size 4 at 152?! That is INCREDIBLE. What a difference exercise makes! Thank you for the post on the working out stalling things! I started working out and the scale has not moved for 2 weeks!